When they saw the Russian priests in embroidered robes performing the complicated offices of the church it was believed that they were witnessing the white man’s own method of celebrating a mask festival similar to their own. This woman’s dance mask was designed to frame the face rather than to conceal it. 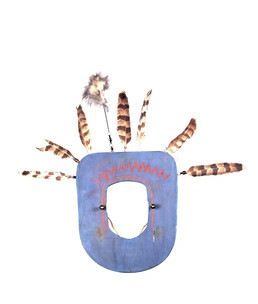 The blue-painted board is decorated with hawk feathers, a feather plume, and beads. Its sinew head-cord ends in large blue beads that were probably imported from China by Russian fur traders. A crown and hood are sketched around the face in red paint, perhaps inspired by the crowned image of Mary on Russian Orthodox icons. This style of mask comes from the Alaska Peninsula, where Yup’ik artists also made them. Andrew Abyo: Yellow cedar, spruce, red cedar could be used — let’s see what else is there — willow, alder, but alder more comes from the Southeast side [of Alaska]. I have never gotten to work with alder, have you Aron? Some people who work with alder to make masks say that when it’s green, they say it just carves like butter. Yellow cedar is really easy to work with, also. Yeah. . . .